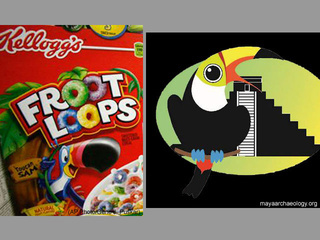 The Maya Archaeology Initiative is fighting back against claims by Kellogg North America that a bird depicted in MAI's logo is too similar to "Toucan Sam," the fictional spokesbird for Froot Loops cereal. Hint: Sam is on the left. Disturbingly, the villain in this Kellogg Adventure and its related games — and the only character who is of color [other than the birds] — is a "witch doctor" with a cackling screech. Apparently, he is supposed to be a Maya. At best, this is culturally insensitive. I would characterize it as a demeaning caricature of an advanced and ancient civilization about which your game developers know nothing. To be fair to Kellogg, companies do need to be fairly aggressive in defending trademarks against dilution, and it may have intended only to stake out a position for that purpose rather than to go to the mat against a non-profit educational/archaeology group. (Which, by the way, could probably use your support, if you're interested.) I guess we'll find out. The parties are evidently pursuing settlement talks. For its part, MAI says it "has no present intention of directly challenging Kellogg's disrespectful treatment of Mesoamerican indigenous culture," so that's one bargaining chip Kellogg should probably consider.